I mean I really like cereal in the way that I wish I could install several cafeteria-style dispensers in my kitchen. I do not have a single drawer but I would give up that dream in return to have several varieties of cereal always on hand and ready to tumble when I saw fit. I am only slightly exaggerating. Many meals of my day involve cereal. It is a no-brainer meal. Thus the multiple varieties I would like to always have on hand with the dispenser! It only makes sense. Sigh. A girl can only dream. The makers of cereal know that one usually eats cereal alone, staring directly ahead, and reflexively using a spoon to shovel cereal into ones mouth. This is why they decided that they should probably entertain you during your several solitary moments by providing fun games, trivia, crossword puzzles and new recipes to try. I bet most cereal-eaters could recite the nutritional information of their preferred brand by heart because between the box and junk mail on the table, the box probably wins their attention nine times out of ten. 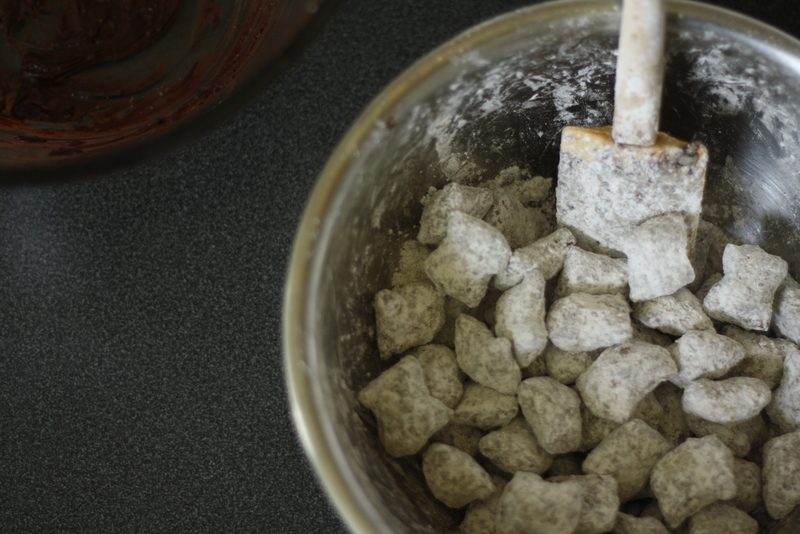 Speaking of recipes on cereal boxes, Muddy Buddies is probably the best only one to make. It is also the second thing I attempted as a child to concoct in the kitchen by myself. This cake being the first. 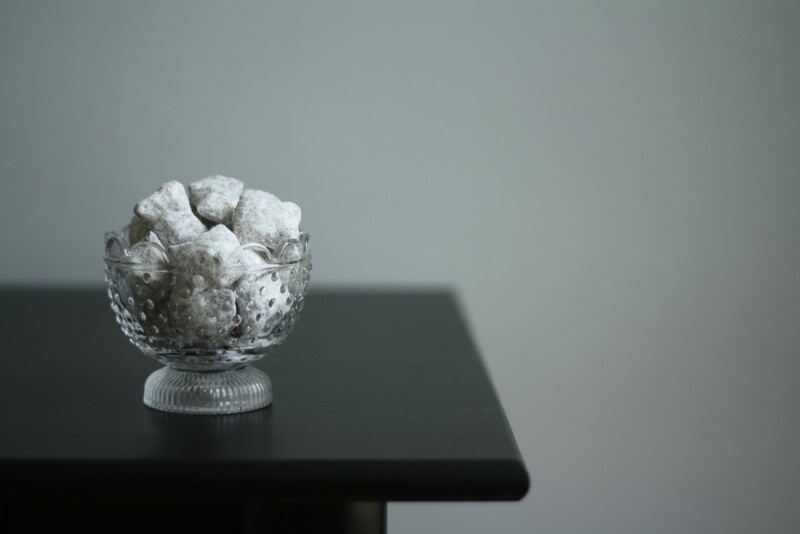 Muddy Buddies came back on my radar a few weeks ago when my friend and I started reminiscing about childhood snacks. If Muddy Buddies are an unfamiliar part of your childhood then let me give you the low-down: melt peanut butter, chocolate, and butter together then pour all that goodness over the Chex cereal of your choice until coated and toss the whole thing in powdered sugar. My friend knew them as Puppy Chow but honestly I don’t know which name is better. They both rank fairly high on not-the-most-appetizing-name list. But a kid could care less what they were called. Peanut butter? Check! Chocolate? Check! Non-appetizing name? Who cares! 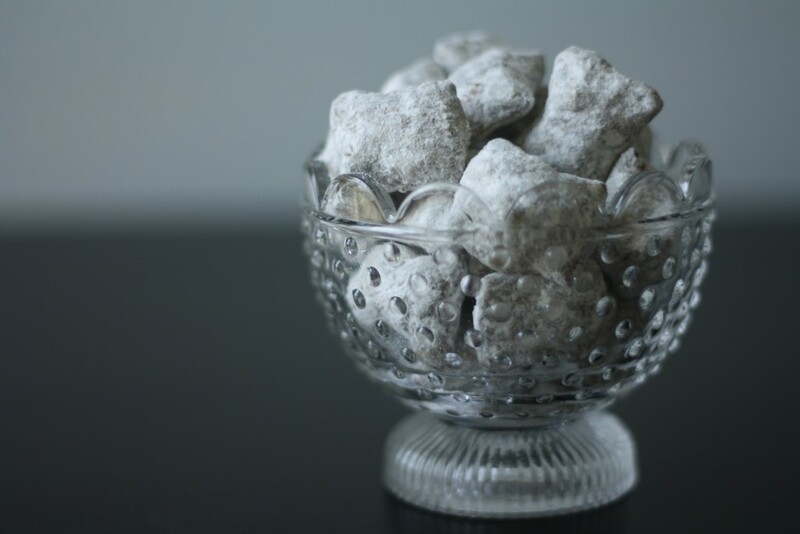 Well now that I’m a fancy grown-up lady, I require a little bit more class (let’s be honest only about 35% of the time) than serving a bowl of Puppy Chow for dessert. 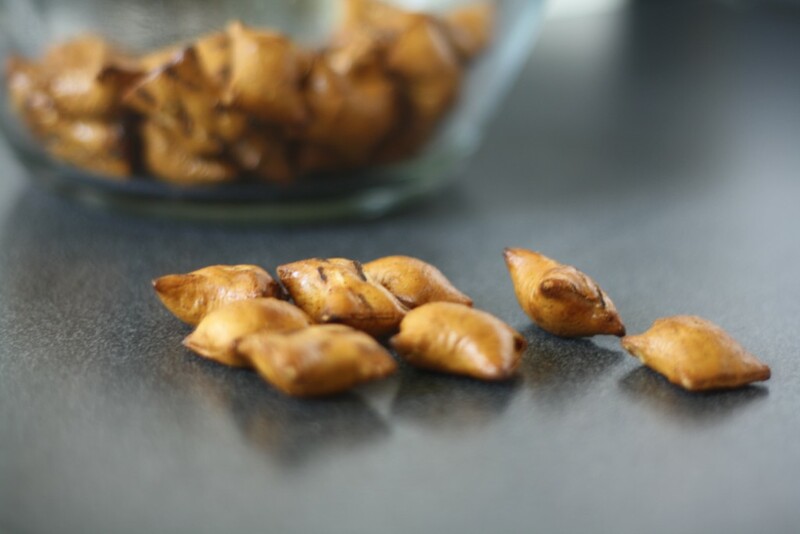 This is why I decided to make an adult version with, are you ready – PEANUT BUTTER FILLED PRETZELS! 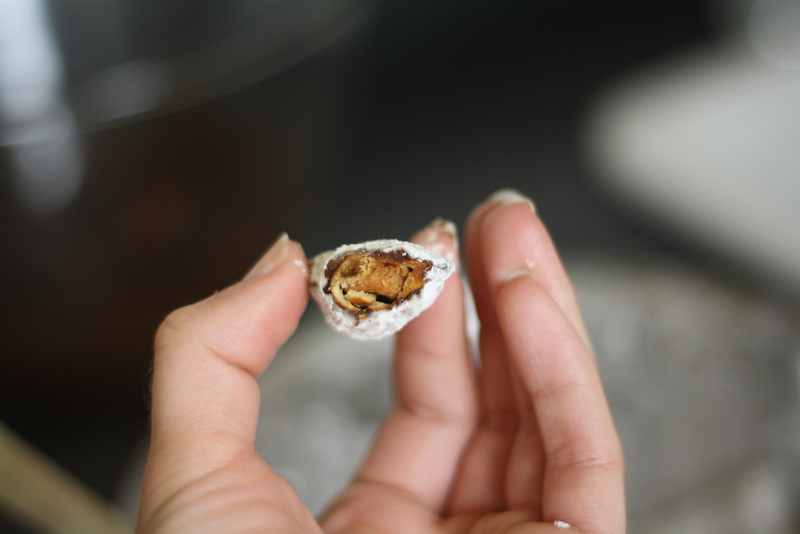 Crunchy, salty, involves chocolate and is peanut butter filled. This hits every dessert mark with flying colors. 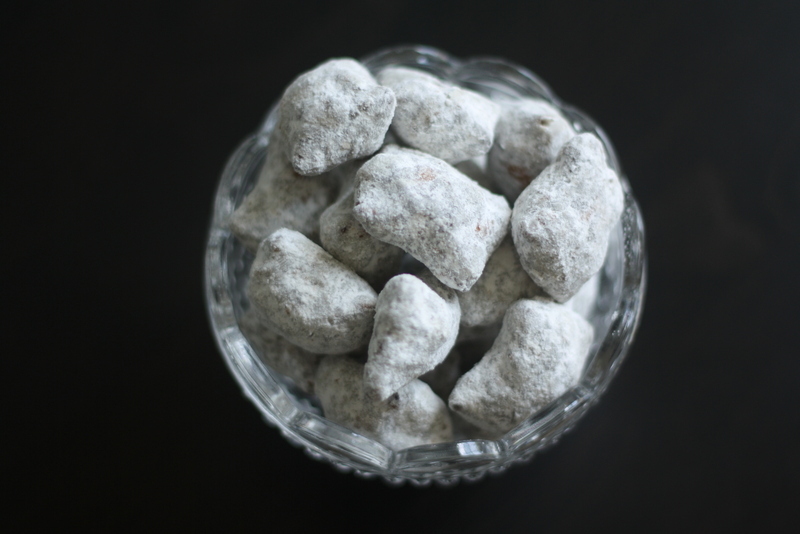 Since we are on the subject of classy, it was required that the name be changed from Muddy Buddies and/or Puppy Chow. According to Wikipedia a dragée is a bite-sized form of confectionery which can have another purpose (e.g. decorative, symbolic, medicinal, etc.) in addition to consumption purely for enjoyment. Pause. Just Another Creepy Food Blog Picture Of Hands And A Bite. End pause. Symbolic of my childhood and I’m pretty sure I consumed the entire batch purely for enjoyment; peanut butter filled pretzel dragées are the pearl-wearing set of the dessert world. Bonus if you fance them up with a bowl that is actually originally intended to be a candle holder from IKEA. Measure the powdered sugar into a large bowl and the peanut butter filled pretzels into another large bowl. Line a baking sheet with waxed paper. Set all of this business aside. 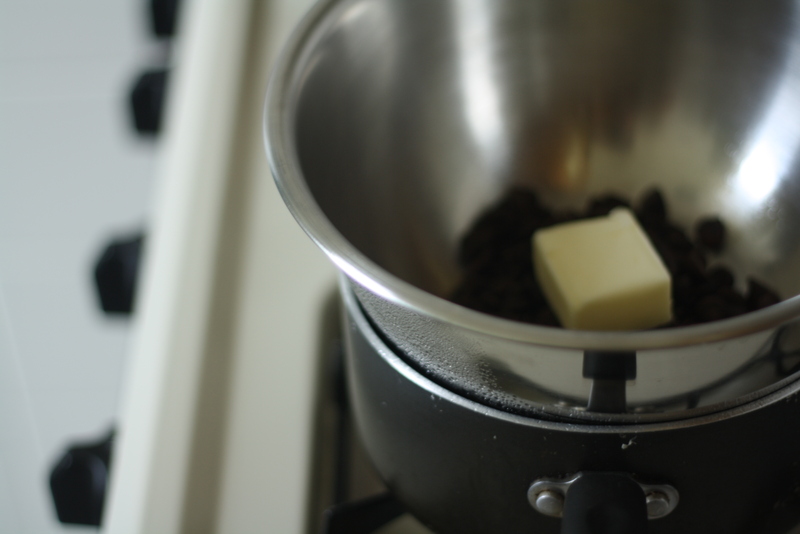 Melt the chocolate, butter, and a pinch of salt together in a medium heatproof bowl set over a pan of simmering water. 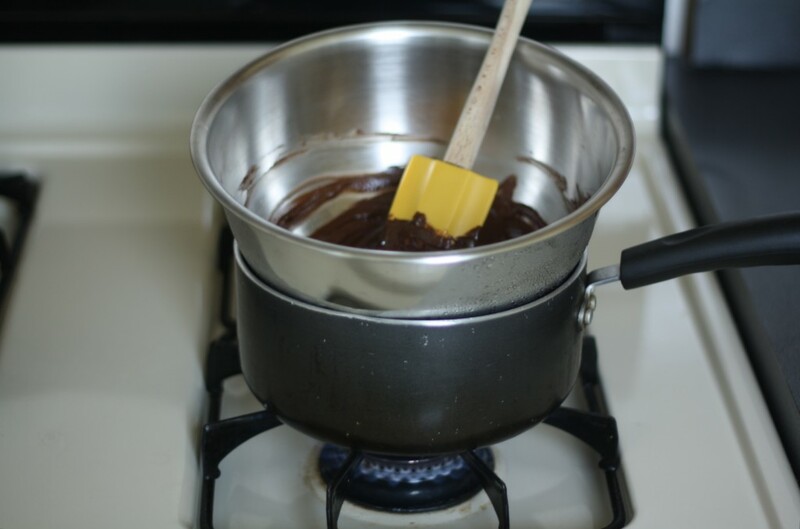 Stir occasionally until the mixture is smooth and the chocolate is melted. Remove from the heat and stir in the vanilla. Pour the chocolate over the pretzels and stir until all the pretzels are evenly coated. Pour the mixture into the bowl of powdered sugar and toss until each piece is well covered. The pretzels will want to stick together, but break them up so each one gets a little bath in the powdered sugar. Spread the coated pretzels on the prepared sheet to cool. Store in an airtight container in the refrigerator. I know them as puppy chow, and I love them that way. But the name doesn’t matter too much to me. What I’m excited about here is the addition of peanut butter and salt. I cannot wait to try these out. Yes! Agreed! The peanut butter, chocolate and pretzel combo is THE BEST! My husband calls pretzels, “salty biscuits,” because they are basically a non-entity in Ireland, where he is from. They were one of the 2 items of food I would seriously get a hankering for when I was living there. The other was peanut butter. And guess what I did when someone sent me a care package with peanut butter and pretzels in it? Promptly combine them by dipping the pretzels in the PB. What was I thinking? I TOTALLY should have dipped them into chocolate too! These look awesome! Salty biscuits! I love that name for pretzels. Maybe I should rename these “salty biscuit muddy buddies”? Oh, wow. 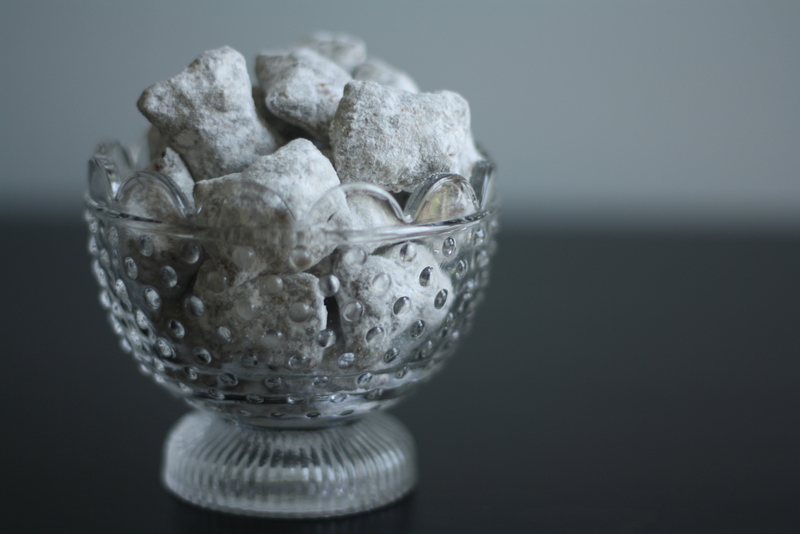 What an amazing riff on my beloved Puppy Chow! I’m originally from the Seattle area, too, and I made this probably once a week as a kid. Thanks for sharing–and for bringing back such sweet memories.